A revelation on metaphysics, cosmogony, quantum physics, Hinduism, Buddhism, Tantra, the Apocrypha, Kabbalah, the Western Mystery Tradition, dreams within dreams and multiverses without end. 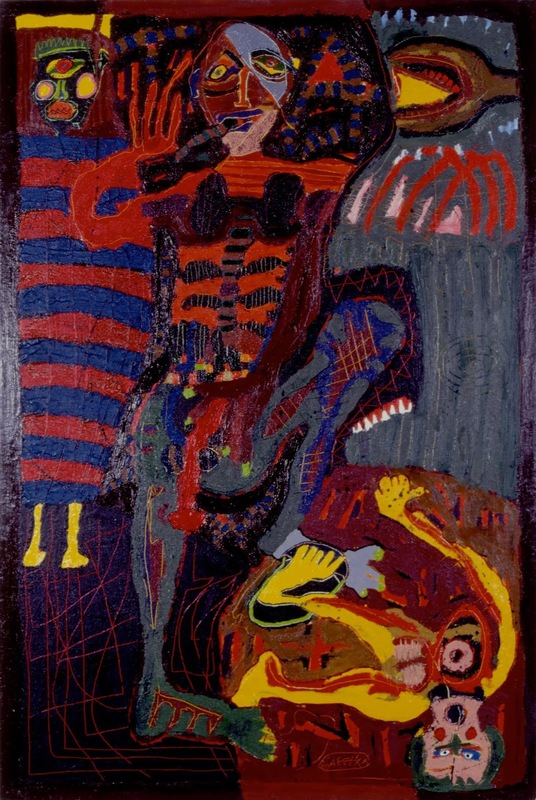 With art by the figurative expressionist painter Michael Hafftka: Kālī Yuga, 1977. Revelation: A Screed on Dreams and Worlds Without End is now for sale on Amazon, Barnes & Noble, Google, and Apple iBooks. 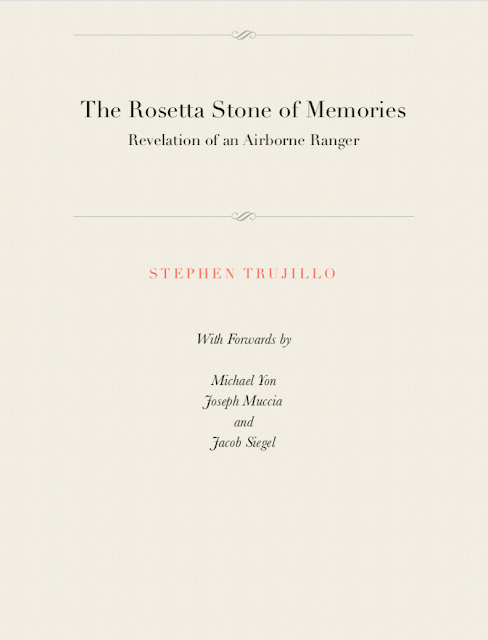 The entire text is available free on GoogleBooks: I made the complete text available as a .pdf download. The only reason to purchase this book is if you are kindly disposed towards me and wish to help me budget for a new Mac. I make anywhere between $3.50 and $6.50 in royalties per copy sold, depending on the platform. I also published Revelation on Academia.edu. If you subscribe to that service, you can download it there. I also posted Revelation for free download on ResearchGate. You can also download .mobi and .ePub files for your eBook reader of choice. All that I ask, if you download Revelation for free is, please review it! Review it anywhere. Review it on GoogleBooks, on Amazon, Barnes & Noble, or on GoodReads. Say that you hate it, say whatever it makes you feel. I do read my reviews, and sometimes, I cite and quote reviewers in succeeding books. Readers who reviewed my first book are cited in Revelation. Not for vanity. But because they became part of that narrative. Revelation is on GoogleBooks. FREE. Revelation is on GooglePlay: $9.99 ($7.99!). Revelation is on Barnes & Noble Nook: $9.99. Revelation is a Barnes & Noble paperback: $34.99. Revelation is an Amazon Kindle eBook: $9.99. Revelation is an Amazon paperback: $14.99. Revelation is on Apple iBooks: $9.99. Revelation is FREE on Academia. Revelation is FREE on ResearchGate. Revelation is FREE as a .mobi eBook. Revelation is FREE as an .ePub eBook. Here is Hafftka's Kālī Yuga (1977) in large format. Thank you to Michael for permission to use this painting! 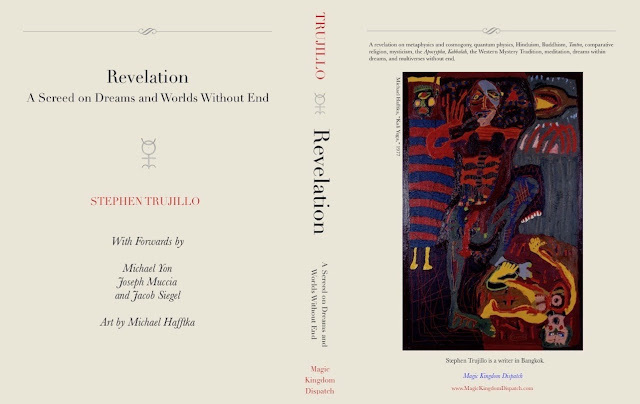 Estéban Trujillo de Gutiérrez's book Revelation: A Screed on Dreams and Worlds Without End." I wrote an analysis of Kālī Yuga. I am not an art history major, but I am a rule breaker and I know a bit about Kālī Ma. I included Hafftka's 1977 Study for Kālī Yuga, and the Kālī Yantra. Thank you for your eyeballs!